Craving baked pasta, but tired of the same old mac and cheese? This classic comfort food is a great way to give new life to leftover chicken, or use rotisserie chicken for ease. 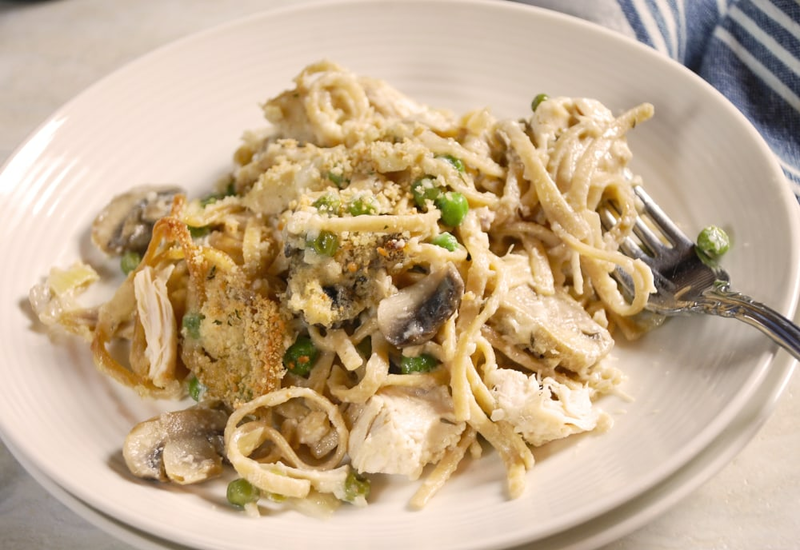 Whole grain pasta, chicken, peas, and mushrooms are bathed in a delicious cream sauce where the flavor of the wine, mushrooms, and Parmesan cheese shine through. Baking the pasta, sauce and chicken in the oven really allows the flavors to meld, resulting in a creamy, decadent main course. The rich dish is topped with a mixture of breadcrumbs and grated Parmesan for a bit of crunch. Chicken Tetrazzini can be assembled ahead of time and refrigerated until ready to bake. Prepare through step 4, then cover and chill. Before serving, cover with foil and bake for 20 minutes. Remove foil, and bake until golden brown and bubbling, 15 to 20 minutes more. Per Serving: 889 calories; 48g fat; 54.0g carbohydrates; 55g protein; 191mg cholesterol; 903mg sodium. I love pasta, and this chicken tetrazzini is one of the reasons why. Noodles, butter, wine, garlic. What more perfect combination exists?! This dish had so much amazing flavor, I'm obsessed. Add a little bit more cheese if you're feeling naughty! This was a classic Italian dish, definitely one of my top three favorites. My wife will probably say it's her number one. We prepped it in the morning, and baked it in the evening for dinner, which was so perfect and convenient.